For forty years the HFPA has recorded interviews with famous and celebrated actors, actresses and filmmakers. The world’s largest collection of its kind — over 10,000 interviews — is now in the Academy of Motion Pictures Arts & Sciences Library. The audios are fascinating. Below is an excerpt: in 1992, on the set of Honeymoon in Vegas, two fiery individuals -- Nicolas Cage and James Caan - met each other's match. Cage told us what happened and reflected on the mixed blessings of being a member of the Coppola clan. "Acting with Jimmy is formidable. He's very unpredictable, and has a totally different approach than I have. He likes to be intentionally unprepared, so that things happen accidentally. I like to have an idea of where I'm going and mix it up with a little spontaneity. He would constantly try to get some sort of shock out of me. In one scene, for example, a poker game, out of camera range he surprised me by pulling a switchblade. Now, if I were nineteen and hadn't been doing this for eleven years, it might have been helpful, but I didn't need that. I can get there on my own, in my own time. It's what I get paid for. So I said, "Jimmy, that's great. Thanks, but you know, it's all right. You don't need to pull a switchblade out on me. Our approaches are different, that's all." After I'd say my lines, he'd a stop and say, "Nicolas, if you ever come unprepared again, we're all going to go home and forget about work." But when I look at the movie, I'd have to say the balance is pretty good. I have been acting since I was sixteen. At that age people can say things that aren't very nice. 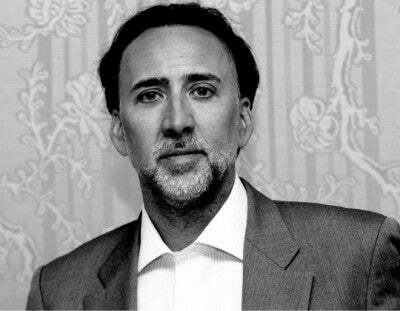 I just decided I didn't need the pressure so I changed my name from Coppola to Cage. Other young actors, I suppose, felt that I couldn't act because I was related to such a powerful director. I had a lot of proving to do. I had to feel I was my own man, but I was very young. I would walk into casting offices, and they wanted to know what Francis was doing. I was prepared for my audition, but all they wanted to do was talk about my uncle. After I changed my name, the first movie I auditioned for was Valley Girl, and I got the part. And I didn't have to talk about him. At the time I really needed to do things apart from family, to prove I was an entity unto myself and not just part of the Coppola dynasty."